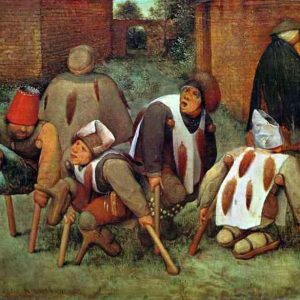 Some of the greatest Old Master artists, through the centuries, have portrayed disability. In the third and final part of Charles Josefson’s series of essays, he considers works by William Kent, Goya, Millais and Géricault. William Kent (1685-1748), Peter the Wild Boy, detail of a court painting on the east wall of the King’s Staircase in Kensington Palace. Image taken from Wikimedia Commons (public domain). William Kent was the leading architect and designer of early Georgian Britain, the era’s supreme polymath: painting, sculpting, interior decoration, metalwork, book illustration, theatrical scenery, costumes and landscape gardening. Originally from Bridlington, Yorkshire, Kent studied in Rome for a decade (1709-1719), and travelled throughout Italy where he met Richard Boyle, Lord Burlington, who would act as his patron and help him advance his career. Kent returned to an England undergoing political upheaval. The last Stuart monarch, Queen Anne, died in 1714 and the Hanoverians were the new ruling dynasty, with George I crowned king. Inspired by Italian art and architecture, Lord Burlington and his protégé Kent promoted the Anglo-Palladian style, a design fusion informed by the classical architect Vitruvius, the British architect Inigo Jones and the Venetian Andrea Palladio. Kent designed interiors for the London residences of leading political and court figures and for several stately houses: Houghton Hall in Norfolk; Wanstead House in Essex; and Lord Burlington’s villa at Chiswick. Through royal patronage and a series of posts in the Office of Works, Kent came to dominate the artistic presentation of the new Hanoverian regime. His two major public commissions, the Treasury and Horse Guards Parade, still stand at the heart of Whitehall. Kent’s career first took off when he won the commission to decorate the royal apartments at Kensington Palace. He undercut the official Royal Painter, John Thornhill’s quote by several hundred pounds. He designed the Cupola Room, with its painted pilasters, marble chimneypiece and gilded lead statues. He remodelled and dedicated the King’s Gallery, originally built for William I, and several other rooms besides. Kent created The King’s Staircase for George I. 45 people from the Royal Household feature in the paintings, twelve of whom have been identified, including the self-portrait of the artist himself. Another of these identified individuals, Peter the Wild Boy, is shown in his green coat. Peter was the feral child from the forests of Germany, who was brought to the English court as a curiosity. Beside him stands Dr John Arbuthnot, medical doctor and satirist, who tried to teach the boy how to speak. Peter became a Georgian celebrity. An effigy of him was erected in a waxwork on the Strand. Jonathan Swift and Daniel Defoe were among the many writers who wrote about him. Eventually, by 1728, the court lost their interest in Peter. Judged uneducable, he was retired to the country. A home was found for him in a farm near Northchurch in Hertfordshire, and he was granted a generous crown pension. He enjoyed gin, loved music, and danced till exhausted. And his life had other remarkable episodes. In the year of the Jacobite Rebellion he was arrested as a suspected Jacobite. Six years later he wandered as far as Norwich. Like a dog, he was fitted with a leather collar with an inscription. Living into his seventies, Peter died in 1785. Locals paid for his headstone. What was Peter’s condition? Initially autism was proposed. 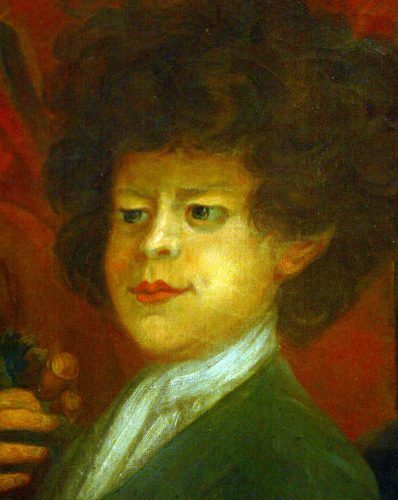 But expert analysis of his portrait instead suggested Pitt-Hopkins Syndrome, since Peter has several typical Pitt Hopkins characteristics: short stature; a thick mop of curly hair; hooded eyelids; and a Cupid’s bow mouth with a pronounced curve to his upper lip. The syndrome is associated with an abnormality within chromosome 18, specifically an insufficient expression of the TCD4 gene. Francisco Goya (1746 – 1828), Mendigos que se llevan solos en Bordeaux (Beggars Who Get about on Their Own in Bordeaux), (c. 1824–1827), National Gallery of Art, Washington. Image from Wikimedia Commons (public domain). Of all the Old Master depictions of disability my personal favourite is this drawing, a quick sketch, by Goya. 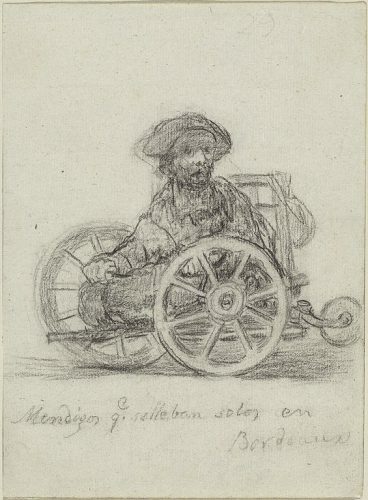 Tenderly evoked with delicate lines of black crayon, the beggar with his amputated, truncated body sits in his bespoke little wooden cart, defiant as a warrior in a war-chariot. A composition of Raphael-esque geometry, the beggar’s head forms the apex of a perfect pyramid. This is an ennobling image of disability. He is a beggar. Yes, dishevelled, he has a careworn, half-shaded face. But there is no self-pathos. He has his ingenious contraption of a wheelchair. And he intends to go places. Travelling the Bordeaux avenues he is a flâneur before the tribe was invented. He is a symbol of resilience. 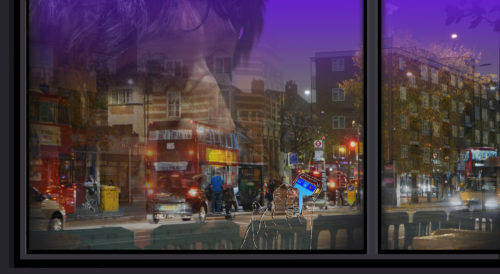 Unlike the spiritual pictures of Duccio or Rembrandt where the focus is upon the disabled person being cured, here — mobile, independent, engaged — the disabled person perseveres in an inhospitable environment; riding in his workable, if crude wheelchair. I think this message is deeply personal to the artist. For when Goya created this image he had been deaf for thirty years. Aged 46, in the winter of 1792-93 he contracted a mysterious illness which almost killed him and stole his hearing. 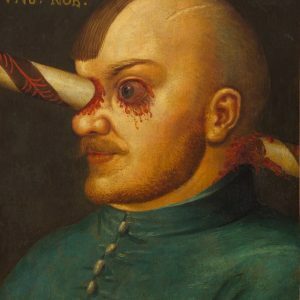 Around the time of his hearing loss, his art took a radically dark turn, becoming morbid, nightmarish even; he developed an obsession for chaos and disaster. Was this coincidence? A reaction to his disability? Or the result of other factors: personal, his wife’s multiple miscarriages, perhaps; or purely political, with the corruption of the Spanish government, the destruction of the Peninsula War and French occupation. Was it coincidence, too, that after his hearing loss Goya’s work as a portraitist reached its apogee? Sans the background noise, were his skills of observation intensified? Now he was old and ailing. He had fled the repressive regime of Spain’s reactionary ruler, Ferdinand VII, for Bordeaux, where he would see out the final four years of his long life. He spoke no French. Drawing, always the mainstay of Goya’s work, was his principal means of self-expression during his time in Bordeaux: preparatory studies and private exercises. It was part of his way of adapting. Drawing served for his journal, the means by which he could continue to communicate and entertain his friends. Black crayon was his lifeline. John Everett Millais (1829–1896), Blind Girl (1856), oil on canvas, Image from Wikimedia Commons (public domain). Birmingham Museum & Art Gallery, England. 1848 was the year of revolution in Europe. The barricades were raised in streets all across the continent, west and east, from Paris to Bucharest, north and south, from Berlin to Palermo. Everywhere, so it seemed, hopeful liberals were rising up against the conservative establishment. There was a conflagration of insurgency. The movement began in France, causing King Louis-Phillipe to flee. The Second Republic was proclaimed on February 24, and the wisdom of the Austrian Prince Klemens von Metternich was confirmed: “When France sneezes, Europe catches a cold.” Kaiser Friedrich Wilhelm IV of Prussia yielded and permitted the creation of a Prussian Assembly. In Italy new constitutions were declared in Tuscany and Piedmont, the common will being to expel their Austrian overlords. In Prague, the Czechs revolted in the cause of self-government. 1848, the year of revolution, the year the Communist Manifesto was written, was also the year the pre-Raphaelite Brotherhood was founded, at 83 Gower Street, the London family home of John Everett Millais. Millais was a child prodigy, who aged 11 became the youngest student to enter the Royal Academy Schools. Embracing the spirit of his Age, Millais sympathised with social and political outcasts, the heretic, the Jacobite rebel, The Huguenot refuge and with women. This is expressed in his picture, The Blind Girl. The picture depicts two itinerant beggars, two sisters. Millais first asked his wife Effie (her marriage to John Ruskin annulled) to model for the blind girl, the musician with the concertina, but later replaced her with Matilda Proudfoot, so quintessentially pre-Raphaelite with her red-hair and ruddy-cheeks. The younger, blonde sister was modelled by Isabella Nichol. 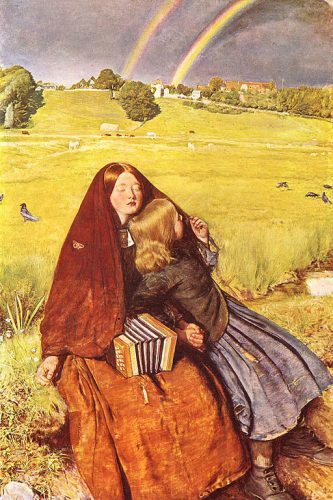 Millais shows how the blind girl relies on her other senses: she reaches out to feel the grass and tilts her head toward the warmth of the sun. The two girls resemble a Quattrocento Virgin and child; the picture has an obvious spiritual dimension. Millais taps into the longstanding Christian tradition, whereby, as well as being afflicted by their loss of sight, blind people were seen as blessed; that deprived of the visual pleasure of the material world, they may be closer to the divine: to God. The rural landscape is idyllic — the small stream that runs to the back of the girls; the yellow meadow stretching to the hill; the trees, the birds and the farm animals grazing — but it is also autumnal. All that is earthly decays and we must keep our focus on the eternal afterlife. As is often so, Sir John Everett Millais was eventually absorbed into the establishment he had castigated. He painted portraits of both William Gladstone and Benjamin Disraeli, and was one of the wealthiest artists of his day. Théodore Géricault, Raft of the Medusa, oil on canvas, 1818-19, Louvre, Paris. Image from Wikimedia Commons (public domain). Gargantuan in every sense, measuring more than 23 feet by 16, The Raft of the Medusa is among the most dramatic paintings in the History of Art. Epically cinematic before cinema, it is the masterpiece of that archetypal Romantic Théodore Géricault: flamboyant, daring, suffering. 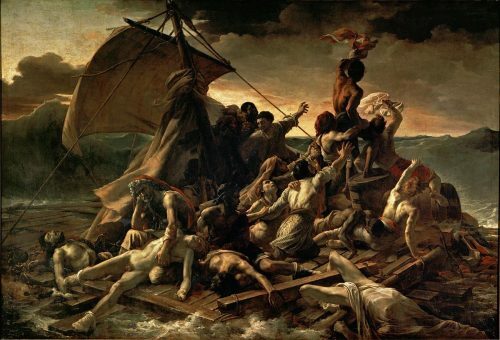 Exhibited at the Paris Salon of 1819, then titled The Scene Of a Shipwreck, the picture represents the dynamite political scandal of Restoration France. When the frigate Medusa sank off the coast of Senegal in 1816, 147 passengers were abandoned on a raft. Settling into the boats, the Royalist captain, officers, and the well-heeled rowed to safety. The rope to the raft was cut. With scanty provisions the castaways drifted for 13 days. When the raft was sighted, 15 cadaverous survivors were left. The cannibalism gripped and revolted the public; strips of human flesh were hung from the mast to dry. While the Raft of the Medusa proved a contemporary cause célèbre, Géricault’s other great major works, his series of ten portraits of people with mental health issues, were not discovered until fifty years after his death. While Portraits of the Insane may not be an acceptable title in our more politically correct era, the portrayals themselves are without question candid, uncompromising, and sympathetic — sensitive, even. Géricault worked with his friend Dr Etienne-Jean Gorget, the chief physician of the Salpêtrière, the women’s asylum in Paris. Working from life at speed, Géricault’s dark backgrounds and loose brushwork mirror the confused, brooding minds of his sitters. Insane Woman (La Monomane de l’envie) (1822), oil on canvas, Musée des Beaux-Arts de Lyon, France. Image from Wikimedia Commons (public domain). Painted in 1822, The Insane Woman depicts a woman diagnosed with ‘malicious envy’ and ‘hysteria’. 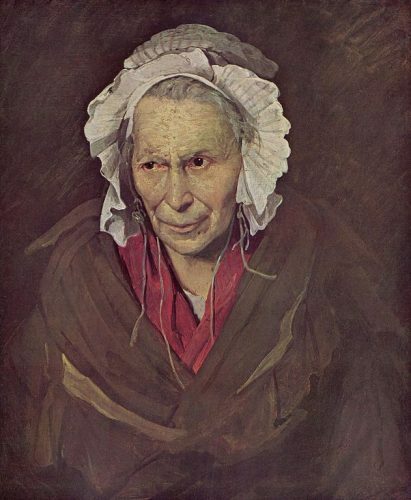 Her aged face framed by her robe and frilly, ragged bonnet; her eyes fixed intently, red-rimmed with suffering; her mouth taut. The artist’s interest in psychiatry was rooted in his personal experience. His grandfather and one of his uncles died with mental health issues. 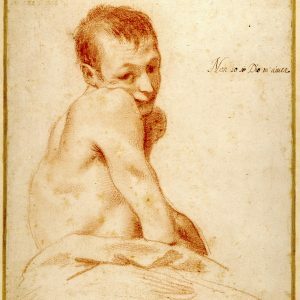 Géricault himself experienced a mental breakdown in 1819. Returned to France from England in 1821, he had withdrawn to the country, penniless, and suffered a series of riding accidents. In the eleven months before his death he was bedridden. He died aged 32. In this period of Enlightenment, when rationality reigned, there was a move away from moral or theological explanations for disability and mental illness. New scientific theories were developed. Leading psychiatrists like Etienne-Dominic Esquirol (1772 – 1840), developed the discredited science of physiognomy, analysing facial features so as to diagnose character or mental disorders. Esquirol had over 200 drawings made of his patients. Some of these drawings were shown in the salon of 1814. Another exhibitor at the 1814 salon was Théodore Géricault. Though ahead of his time in several respects, Géricault was a man of his era: he defined his sitters solely by their condition, and did not record their names, for instance. But his compassion, authenticity and artistic brilliance remain clear and striking. Still the humanity of his portrayals pricks our conscience. We have travelled far. But, almost a century on, does our contemporary society suitably value disabled people and people with mental health issues? Are all included? Are all treated equitably? Respectfully? Humanely? What reforms must we make? A brilliant essay. I knew of the way that Goya portrayed the maltreatment of disabled people, but appreciated the reminder of his work and that of Millais in the same context. The essay deserves an award, if only to draw attention to Charles Josefson’s well researched work.